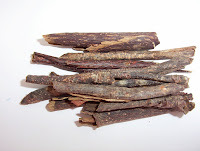 This is mauby bark that is brewed with other spices such as cinnamon, clove and nutmeg to make mauby drink. Some people also use as part of their spice mix, orange peel and star anise. This is the drink after it has been brewed and ripened (set) for 48 hours. Here is it presented chilled with ice. Depending on where you are from in the Caribbean, people have different ways of making mauby.